Well, Beel is amused. Ichthyologists Rick Mayden and Steve Layman described five species of darters, small fishes related to yellow perch and walleye, and named them after Barack Obama; former presidents Teddy Roosevelt, Jimmy Carter, and Bill Clinton; and former vice president Al Gore. Descriptions of these fishes were published Bulletin of the Alabama Museum of Natural History. Darters are small-bodied fish in general, and the spangled darter reaches lengths of ony 48-mm long (less than two inches in length). Beel says, it is going to be hard to carve a fillet off of that! Beel has heard many ignorant souls complaining about this “blatantly” partisan act, failing to remember that Teddy Roosevelt was a Republican. Tomorrow, Beel will present another fish named for a Republican president. 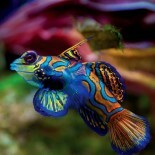 This entry was posted on December 23, 2012 by denstormer in Commentary and tagged Ichthyology.